Once in a while I have to push myself to do something I just don’t feel like doing. Our day hiker meet-up was going downtown to a little park and I didn’t feel like going. I almost called to cancel, but I didn’t. My bff, Linda, wouldn’t have let me anyway. Driving down the thruway, I would see people walking on this strip of cement in the middle of the Niagara River and wonder about it. 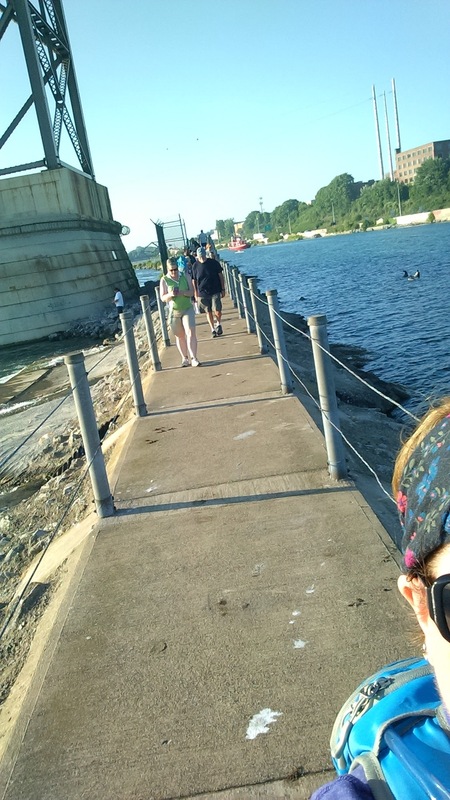 I thought it would be cool to walk “in” the middle of the Niagara River on that strip of cement. I didn’t even know it was a park! You see, there is a long cement pier that splits the Niagara River and separates the Black Rock Canal and the Niagara River. The pier is very narrow and runs about a mile and a half. 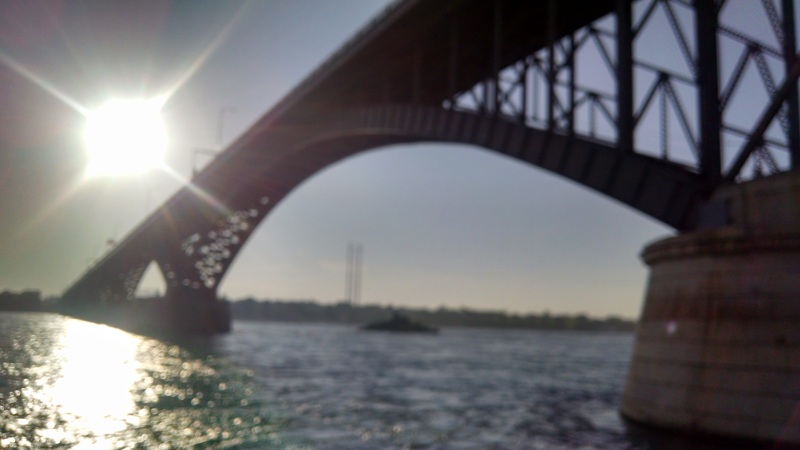 It goes under the Peace Bridge that connects the United States and Canada. Now that I made up my mind to actually go on this walk, I was really excited to check it out! History lesson time! The Native Americans had their own name for this island, but back in 1812 the English called this island Squaw Island. That was the name that was used until last year when a Native American woman petitioned the Courts to change the name because members of the Seneca Nation of New York felt the name was racist and derogatory to Native American women. It is now called Unity Park. 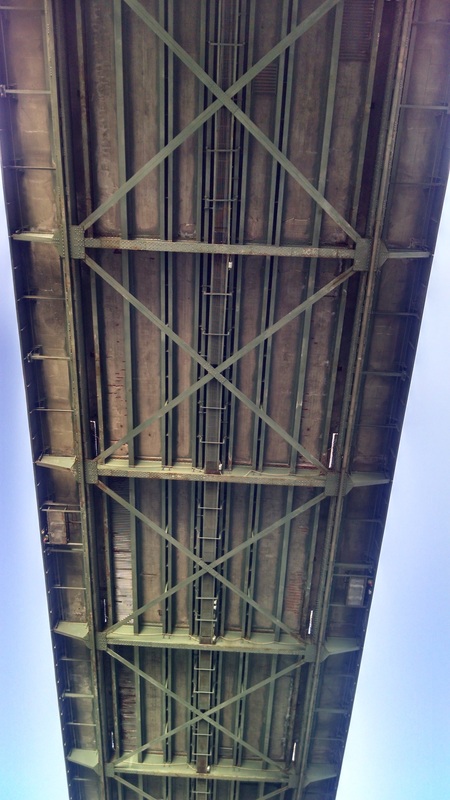 The island is home to two parks – Broderick Park and Bird Island Pier – and you get to it by crossing a drawbridge. Bird Island Pier was built in 1860 and there are a lot of people that fish here. Apparently, you can catch some really big fish! I only saw a dead one on the sidewalk, sorry no pictures of that! Broderick Park was the location of the former Black Rock ferry. It linked Buffalo and Fort Erie, Ontario until the mid 20th century. The ferry’s dock was used as an Underground Railroad station. 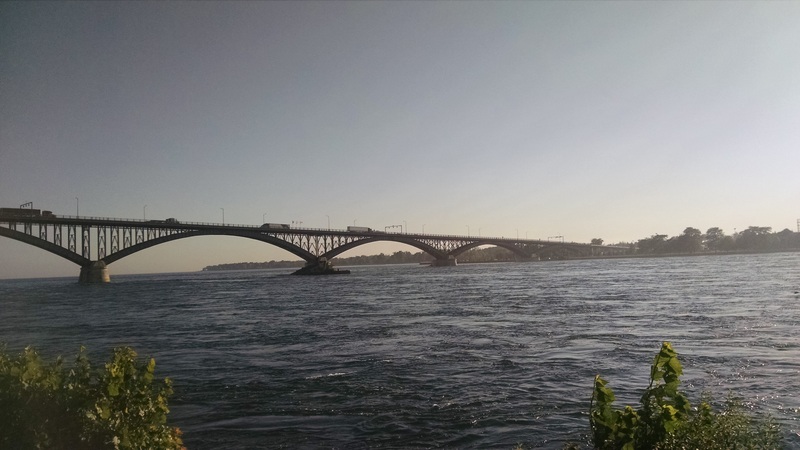 Escaped slaves would take the ferry or other boats across the Niagara River to Canada to their freedom. This is also a great place to watch the sunset. From my last post, you know I love the sunset on the water! The evening walk began with a little geocaching, of course! 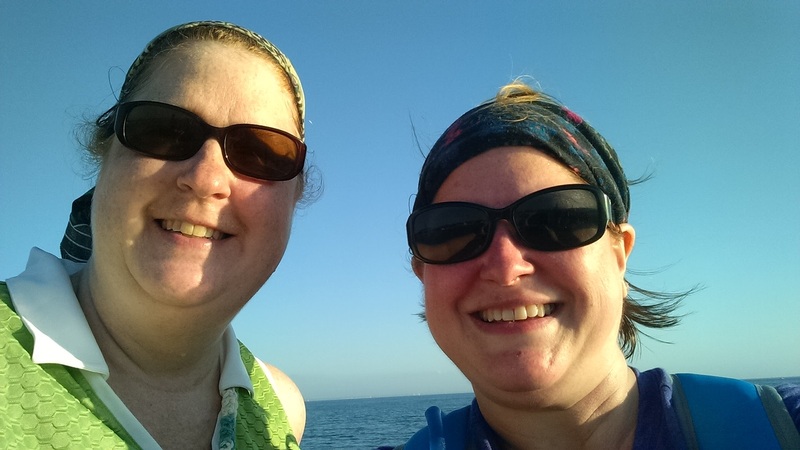 I was with Linda and when Linda is around, there’s a cache to be found! The cache was in dire need of maintenance! Which reminds me, I still need to log that! 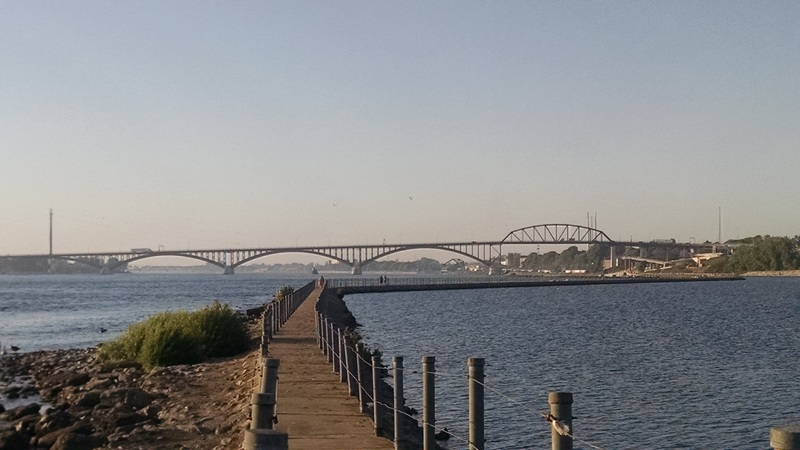 We walked through Broderick Park and approached the narrow entry of the Bird Island Pier and looking to my left I could see the concrete thruway that Buffalo thought would be so smart to put right on the water. How beautiful. NOT. But, in the canal were crew boats. The men rowers were grunting and rowing so fast! 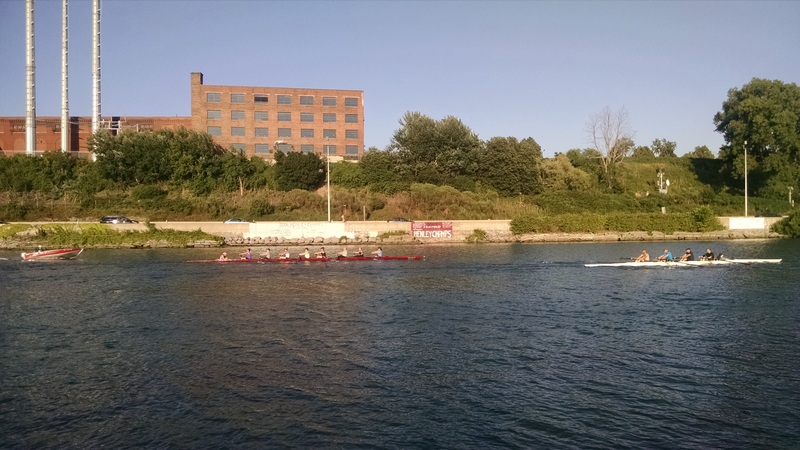 The lady rowers were almost as fast, but not quite! It was quite a sight. We also saw the Edward Cotter Fire Boat. 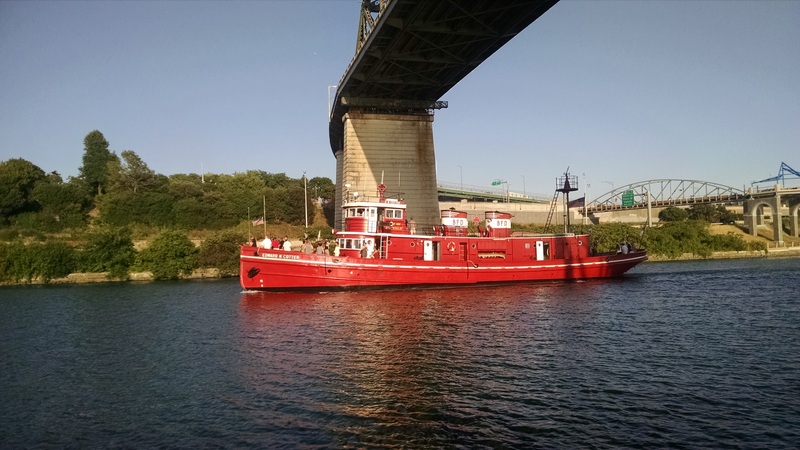 This fire boat was built in 1900 and is still in use by the Buffalo Fire Department. I glanced up and noticed the Peace Bridge looming large above me. I was going to walk right underneath it! How cool is that! 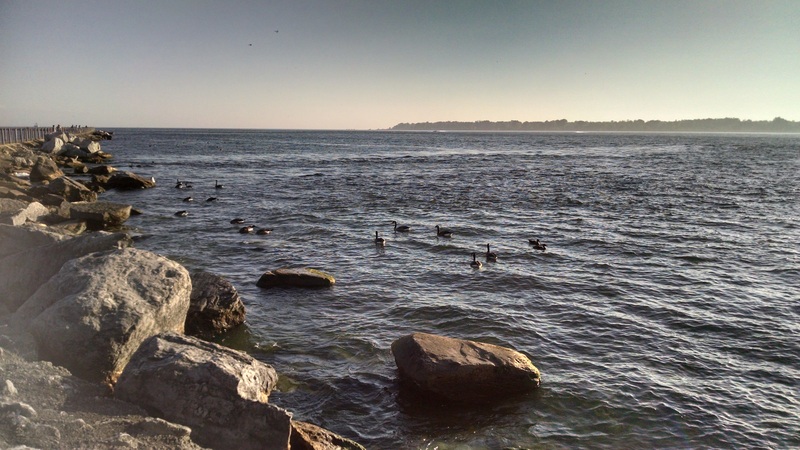 There are many birds that hang out along the rocks on either side of the pier. 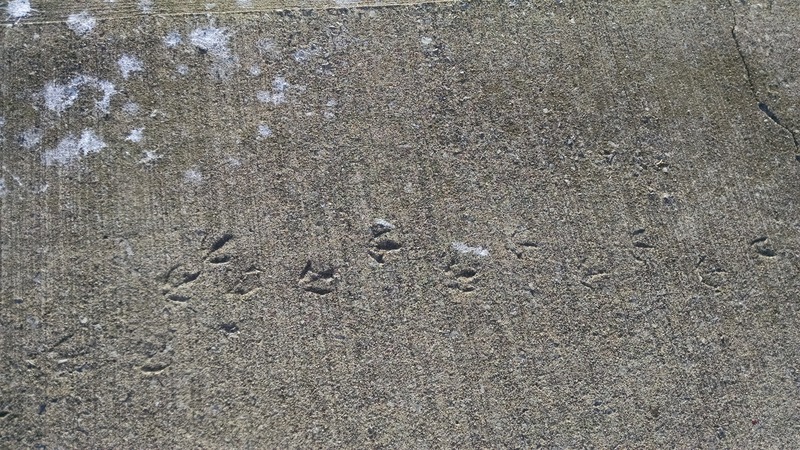 Some even managed to leave their feet print on wet cement, leaving their permanent mark on Bird Island Pier! Walking on the pier you had better watch where you plant YOUR feet! The bird poop was everywhere! Although we noticed that they liked to poop on the left side more than right! 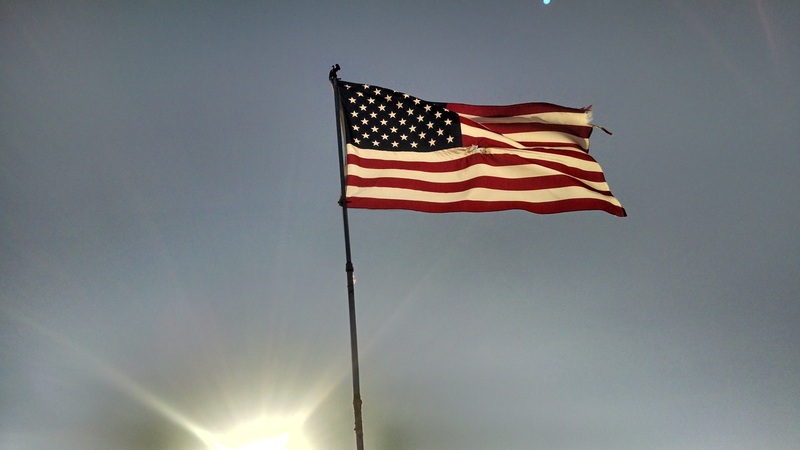 At the tip of Bird Island Pier stands the glorious United States Flag. It was a gorgeous evening for a walk on the pier. This wasn’t my favorite hiking destination; as I like my trails without cement. But, it was fun to finally experience a place I’ve only looked at from a car window traveling down the thruway. Now, back to the woods for me!